If you have to run 72 miles, then I can’t think of a better place that I’d like to do it. I’d set out my strategy for the race during the week leading up to it. I wanted to run light, to spend less time at checkpoints and to pace well to last the distance. This meant that my drop bags were simple enough this time to arrange and on Thursday, I got 6 ziplock bags and placed a sachet of Tailwind in each one along with a cereal bar or two just in case the liquids weren’t working well for me. I also threw some gels into the last 3 of the 6 bags for the later stages of the race in case I needed some more calories along these legs which looked longer and steeper than the first 30 or so miles. Tailwind was the foundation of my nutrition for this race and it worked amazingly well. I’m so happy I discovered this stuff and I now feel really confident in using it for other races. With everything packed, Thursday nights sleep was restless. I was worried about if the tailwind approach would work or if I would starve after 10 miles. 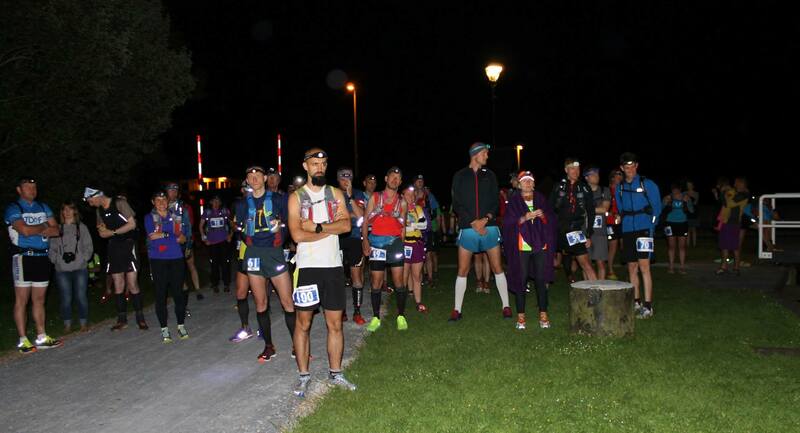 I was taking a bum bag on the race with a windproof smock, foil blanket, headtorch, a light snack and a spare buff. This was far less than I’ve carried before in the big Salomon vest I used in the fling, which was part of the travel light approach, but it made me worry that I would need more. 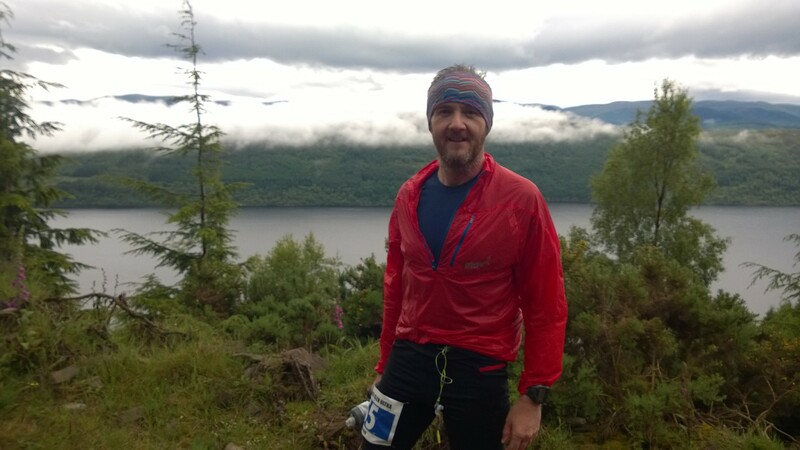 Friday I caught the train via Perth up to Inverness and met up with a friend who was also running the race. He and his wife had a hotel room which they kindly allowed me to use for a shower before we headed to the coach which would take us to the start. 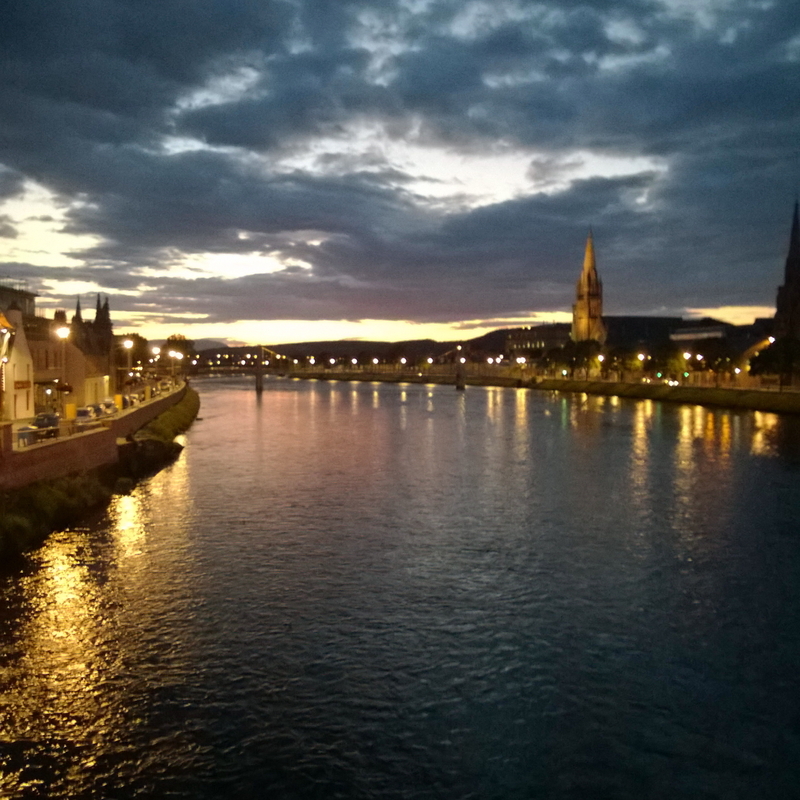 Before then though we had a few hours to kill in Inverness. 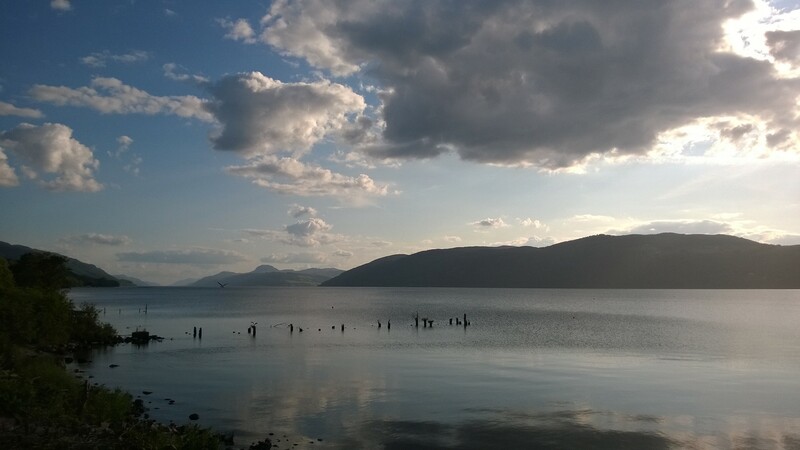 It was a lovely summers evening and we ended up at the Dores Inn for dinner. 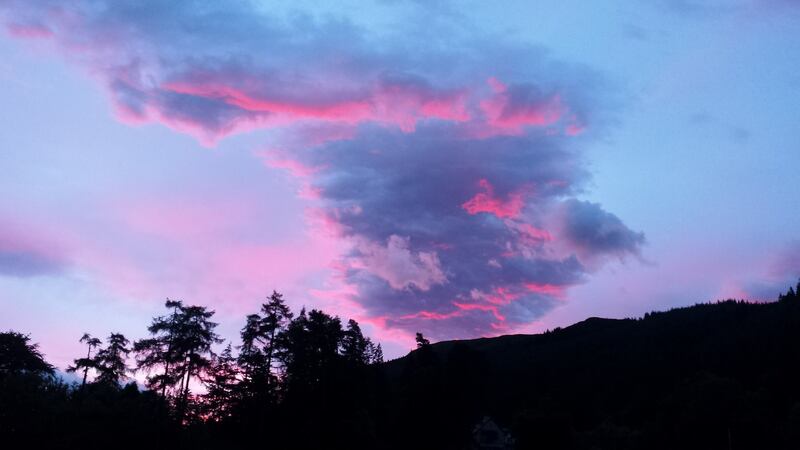 This gave us an amazing view down the glen across Loch Ness. It was scary looking off into the distance of the picture at the start of this post and realising that as far as we could see, wasn’t even half way distance of the race! With a meal inside us, and a shower and quick change back at their hotel, we headed off on the coach to the start line. By now it was 10pm and my sleep triggers were kicking in. I curled up on the back seat of the coach and managed to get some broken sleep during the 1h 30m drive. But the excitement was preventing me from really resting. After handing in drop bags and picking up my race number, it was time to wait again before the start. A few minutes to 1am we all walked across to the bottom of Neptunes Staircase for a pre-race briefing and finally, we were off. Despite my best intentions, I allowed myself to get pulled along for the first few miles with an average pace of about 5m30s\km, which was about a minute faster per km than I wanted to be. Scott and I were running along together for the first mile but he pulled away after that and I let him go. He’s far too good a runner for me to keep up with. I fell in with a couple of guys who were more sensibly paced, but still faster than my target pace. I went along with these guys until CP1 where I let them get away from me and I then settled into my pace. 10 miles in and it was still dark, or at least as dark as it gets in the Highlands mid summer. The first 10 miles had been almost all on canal path, which was quite hard and compacted, but now we were into forest trails and fire roads which were much more enjoyable. We also hit some of the first elevation of the course. This surprised me as I’d thought the first 20 to 30 miles were all very flat. None of the climb was high or tough, just rolling forest trails, but it meant it sapped your energy. At 3am in the morning after being up for over 24 hrs and the adrenalin rush of pre-race nerves, it all took its toll on me. I’ve discovered so many wonderful things from running, but it is moments that produce that kind of view that stop you in your tracks. 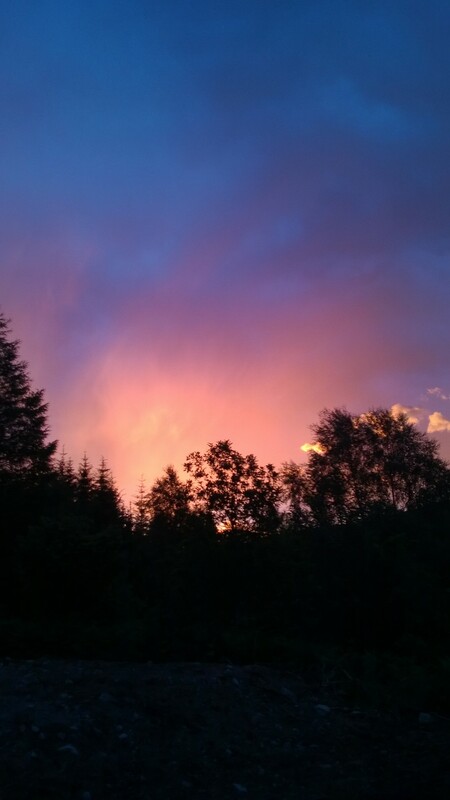 It is unlikely I would ever have been stood, alone in a forest in the middle of the great glen at 4 in the morning to see the sun come up and produce such a spectacular display. The trails now were coming back down to loch side and eventually hit Invergarry where you drop into the village and cross over a small river before climbing back up again alongside the loch. This bit confused the hell out of me and I was convinced I’d taken a wrong turn and was heading back down the opposite side of loch lochy. I eventually got my phone out and switched on the GPS signal to see where I was on the map, of course to be reassured I was heading in the right direction. Now it seems utterly stupid of me to have become so disoriented, but in the race things like this just happen I guess. After more forest trails the route eventually got on to the canal path leading to Fort Augustus. 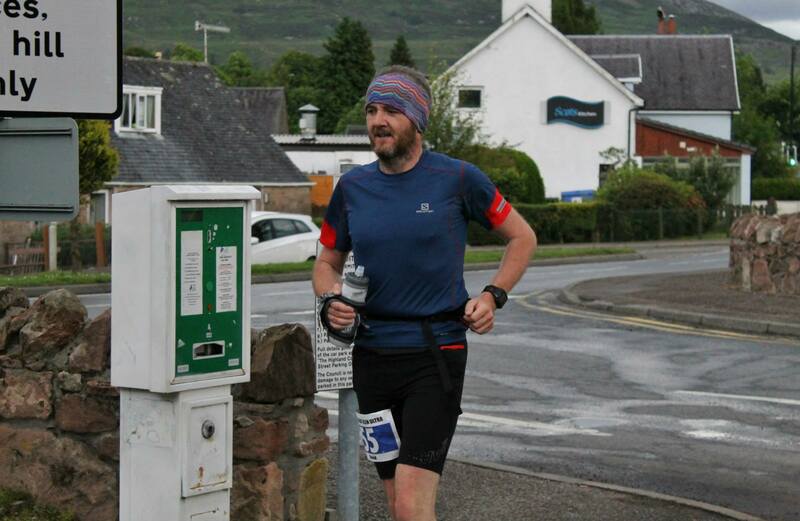 During the race, this felt like very early on, but I realise now that I was probably a good 26+ miles in. After the dark and then the ups and downs of the forest trails combined with overnight tiredness and fatigue, this flat path alongside the Caledonian canal became my nemesis. I knew where Fort Augustus was, which was the next CP and end of this path. In my mind though I thought the path was much shorter and every twist and turn exposed yet another long sweep of path into the distance with no sign of the locks and boats that signal the town. I hit a real low point here. In my head I was having a conversation about why I was doing this, what was I achieving. My running had been great and I’d done the fling and Edinburgh marathon, so why was I even here at all? I was starting to make up excuses in my head about how and why I should drop out at the CP. Eventually the locks came into sight and I knew the car park for the CP was only a few minutes away. I knew what I was going to do, walk in, say thank you, but I’m done, please take me away. Unfortunately for me the CP was staffed by those people in life who you just can’t help but smile at because they make you feel great, no matter how sorry you feel for yourself. There was banter in the air and a few other runners were still there sorting themselves out. I was overwhelmed and before I knew it I was feeling great, eating a cereal bar from my drop bag and filling my water bottle. All the doubts were gone from this point on and I was going to finish this thing. Those ladies at the CP did an amazing job of lifting me out of my slump and at the time they didn’t know it. The people who volunteer for this kind of thing always impress me and now inspire me to help out at events. You all do a wonderful job people and thank you for giving up your time to help people like me who feel sorry for themselves when they hit your check point! So now I was back out and up the road. A short residential bit in Fort Augustus before back on the trail. The trail markers were a problem throughout the day. Whilst they are a vivid pastel blue colour, during a race like this when your mind is all over the place, they were sometimes hard to spot. A guy about 500m ahead of me missed the marker as we exited Fort Augustus and headed north on the A82! I was worried as it is a fast stretch of road and the path had ended. I tried to call him back but he was too far gone and there was no way my legs were up to sprinting to get him, so I call race control and let those guys chase him down. I hope he was ok and made it safely back; it was so easy to miss those markers. This next stretch to Invermoriston was all up and down forest trail so I had plenty of time to walk and get myself back together after the low point. About 5 minutes out of the CP I realised I hadn’t been listening to music, so I switched on my phone and plugged my earphones in. It was amazing how it lifted me and looking back at my times around here, it had a material effect and I need to remember that for future races. After about 30 minutes a guy caught up with me and started chatting. By this time I’d been on my own for an hour or two so was glad of the company. Stephen was from Edinburgh and it was his first time in the race too. We got on really well and eventually ended up running the rest of the race together and having a great time. We hit Invermoriston feeling pretty good and ready to get moving quickly. It had been raining heavily by now and everyone was soaked to the skin. Thankfully the temperature didn’t drop too much so it made it quite pleasant to run in and certainly manageable as long as you kept moving. I knew the hill out of Invermoriston was short and very sharp so it was head down and paced it up there and get it out of the way. At the top was the big decision of the day for most people. The Great Glen Way has a high and a low route. The race brief told us we were taking the low route and thankfully, due to the recce Scott and I did a few weeks ago, I knew exactly where to make the choice. Sadly, lots of others didn’t and it turns out most of the race followed those pesky trail markers to another few hundred meters of elevation to add to their race. 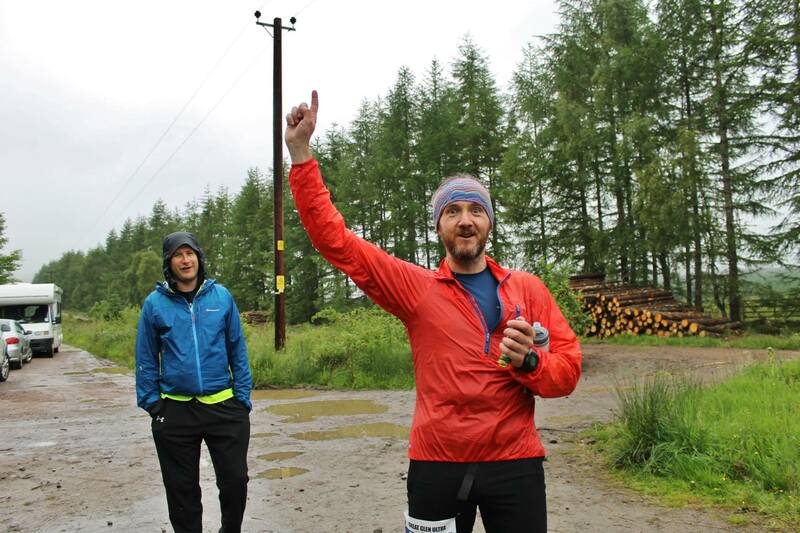 Before Invermoriston we’d also bumped into a few others who were running around us at about the same pace. We were surprised later down the course to see them come up behind us as they’d left the CP before us, but they’d taken the high route and suffered as a consequence. Ah well! Invermoriston to Drumnadrochit is a long section and there was a water point about half way. About two miles before this Stephen and I came across another runner in the race who was clearly not having a good time. We ended up walking to the water point with him to make sure he was safe as neither of us felt he could or should be left on his own as his condition was too poor. I later found out he had been up the front of the race until around this area and running with my friend Scott who said he seemed like a really strong runner. It just shows that anyone can have a bad day. We left him with the CP but there was no phone signal so had to run on to the next CP to let them know he was there. Because it was raining and we’d been going so slow, both Stephen and I were in pretty poor shape too at this point through low body temperature and stiff legs. The jog down to Drumnadrochit helped warm us up and we caught up on the way with Pauline and Derek who we also spent much of the rest of the race with as a big group. I have to say, all the people I met in this race were amazing. We all shared our stories and experiences during the hours we had together and all of them were just incredibly nice and genuine people who I would love to remain friends with. Amongst all the positive things from the race, the people I met was the best thing. Drumnadrochit came and went. I met Mike who is part of the BaM race organising team and who I actually bought the shoes I was wearing in the race from about 9 months ago. We got an update on the guy who wasn’t well and heard he was recovering well which made us all smile. Then it was off again. A long sweeping road around the town before a narrow track heads back up hill. This climb was one of the toughest and a little technical in places. It eventually deposited us out onto a forest road which meandered towards the next CP. This CP came about much faster than I anticipated and I knew we were on the home straight from here. Pauline who was with us had run the race before and explained our route from here to give everyone a taste of these last 12 miles. The trail here headed through a section which felt like we were going to emerge in a snow covered land like Narnia. The trail was narrow and had trees growing in from both sides creating a face slapping experience that we probably all needed to get our backsides moving again. Then came the road. Oh that road. It felt like it went on and on and on. It did actually, it went almost all the way to Inverness. By now we were a group of about five of us. Along the road Pauline and John who had been running with us showed us exactly how strong and experienced they were and set off along the road. The rest of us were too fatigued to keep pace but we kept the in sight long enough to see where we turned off the road and back on to the trail. Then a long, relatively flat forest trail eventually led to a clearing which allowed us to see Inverness for the first time and, amazingly, the sun came out just in time to make it look even more appealing. The trail headed down hill steeply here which actually felt good on the legs. In contract to the fling, my quads were in great shape despite having around 1000m of more climbing to do in this race. I don’t know if I just paced better here or if I am strong or a combination of the two. As we reached the bottom, Derek pointed out that if we picked up the pace, we could still make it in under 15 hours and 30 minutes; the challenge was set! We hit a residential area, around a golf course then popped up on the canal. By now we had less than two minutes to make it. We had a bridge to cross and a road, then on to the athletics track in the stadium before a 200m dash for the finish. Myself, Stephen and Derek all picked up the pace perfectly and ended up crossing in a very respectable 15hours 29 minutes and 47 seconds. 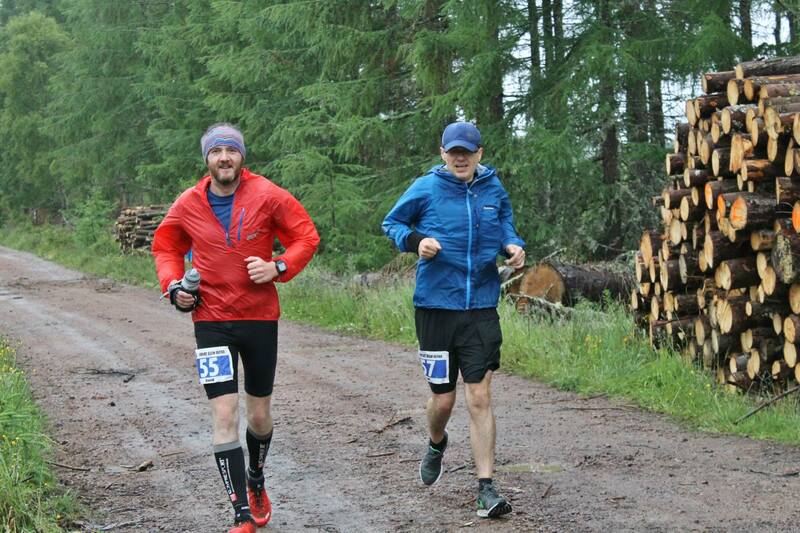 L to R – Myself, Stephen and Derek in a sprint finish with a smile! 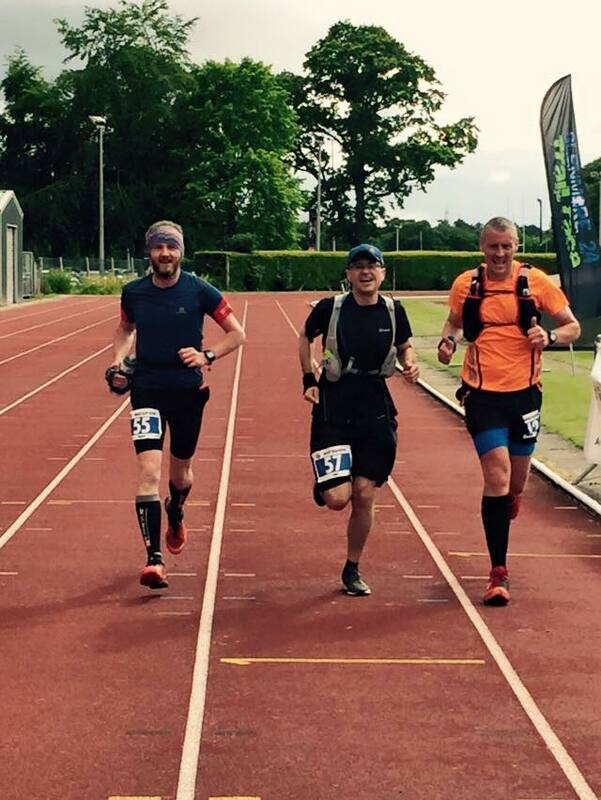 Crossing the line in the sunshine felt amazing and doing it with these two guys made it even better. They were fantastic company the whole way and we all helped each other along throughout the day. We were handed goodie bags and Derek got some ritual abuse for choosing the high route, and then we were done. Saturday I stayed in Inverness and met up with Scott and his wife Lisa again. We headed out for a post race meal, which Scott and I nearly fell asleep at. Despite that, we ended up having a really enjoyable night. I ended up having a stroll around the city afterwards to stretch my restless legs, which I think helped with recovery and my legs felt fine after that. 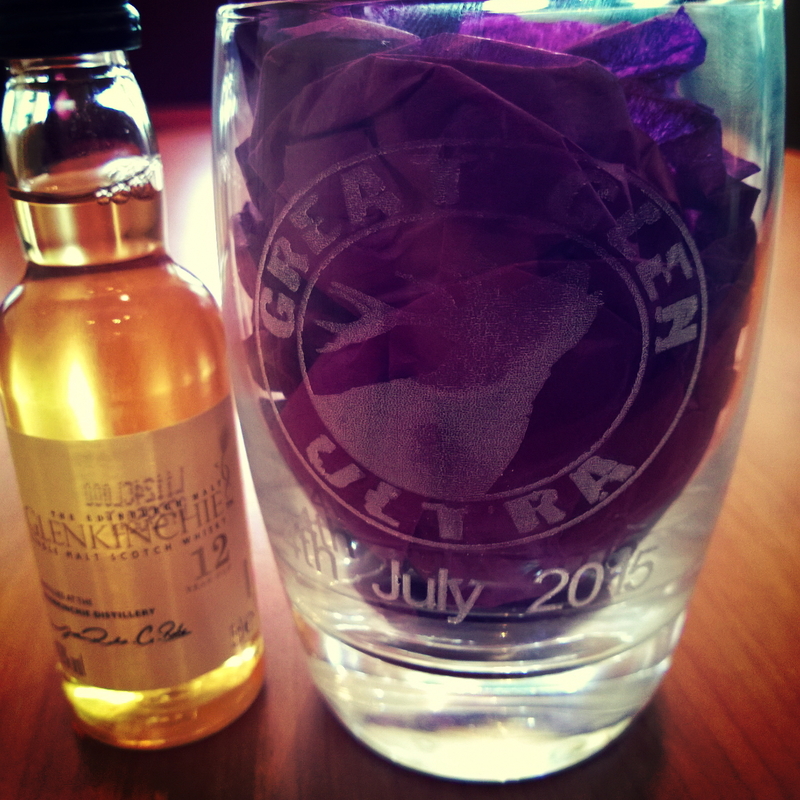 The following day we had a ceremony for the prize giving and every finisher received a whisky tumbler and a miniature bottle. Mike Raffan won the race for the 2nd year in a row in a breath taking 11h 30m. My friend Scott finished 4th despite twisting his ankle around 20 miles in! Incredible performances. Looking back, I am still overwhelmed with how fantastic this race was. I loved all of it, even the low parts and would love to head back and do it all again. There are things I have learnt from this which will help me in more ultras now. My shoes were not a good choice and I needed something more cushioned. My travel light approach worked brilliantly and the hand held bottle is definitely the way to go in future. My nutrition was perfect and I felt fuelled all day, thank you Tailwind! I love the distance, you need to respect it, but it gives you time to correct things and still achieve a respectable time. I loved the route. We are so lucky to have such amazing places like this near by to run through. I think a few more additional race direction arrows might have helped as some of the blue way markers are amazingly difficult to spot especially when tired. I imagine managing a course of this length though is tough work and the guys at BaM put on a great race so no complaints at all from me.